Photos here and here. Video here. MILWAUKEE & RACINE, WISCONSIN – On Monday, hundreds of Wisconsin high school students walked out of class and 23 people were arrested in an act of civil disobedience at US Speaker of the House Paul Ryan’s Racine office, as part of a national day of action demanding Congress pass the clean Dream Act. After Monday, immigrant youth will begin losing protection from deportation under the Deferred Action for Childhood Arrivals program, or DACA, thanks to the President’s cruel decision to end the program, and thanks to Speaker Ryan’s refusal to allow a vote on a clean Dream Act bill. Hundreds of students from Milwaukee School of Languages, Riverside, Reagan, and South Division High Schools in Milwaukee, as well as Horlick High School in Racine, joined the morning walkouts. The students gathered in Racine before marching on Speaker Ryan’s office. At Ryan’s office, hundreds of community members joined the students for an afteroon rally, during which 23 people were arrested while peacefully blocking a busy intersection in an act of civil disobedience to urge Speaker Ryan to act to protect immigrant youth. 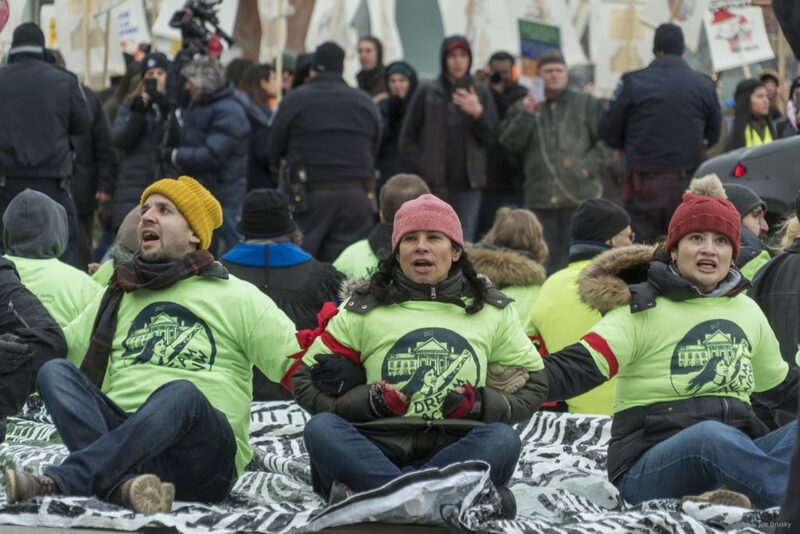 The group who engaged in civil disobedience included children of immigrant parents, public school teachers, elected officials, union members, and a Catholic priest. Two candidates running to replace Congressman Ryan, Randy Bryce and Cathy Myers, were among the arrested. L-R Voces member Joe Shansky, Voces Director Christine Neumann-Ortiz, and South Division High School teacher Bertha Barillas. 3/5/18. Photo by Joe Brusky.